Author James McPhee is actually a pen name that was used by Laurence James. The British writer had a half dozen pen names that he utilized throughout his 30 year career. Fans of men's action adventure novels may know Laurence James as the creative force behind the popular 'Deathlands' series that is published under house name James Axler. James wrote over 32 books of the series' entries including co-writing the very first novel. The three book series kicks off by unveiling an Earth that has been shattered by an asteroid in the year 2050. 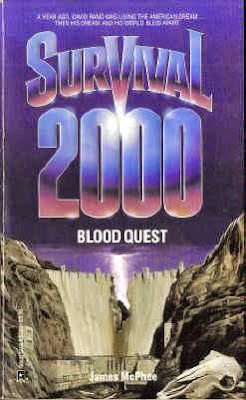 Why isn't it called 'Survival 2050'? Civilization is left in ruins and we see the typical bandits, rovers and rogue Army sadists attempting to market their brand of Hell on Earth. This paperback warrior is a former accountant named David Rand who is left backpacking the wasteland with his sixteen year old son Lee and pit bull Melmoth. The two have a quest that they reach David's wife and two daughters in California. It's the age-old monomyth of a heroic journey to fulfill a quest. Book one of the series, "Blood Quest", is simply the trek the two take to reach California only to find that most of the state is now swimming in the Pacific. With a few clues, they find that their family may still be alive in a small town in Montana. As the two journey through a brutal nuclear winter they battle cannibals, animals and the elements. James is a rather technical author when it comes to firearms and all of these stories describe, in painful detail, every caliber bullet and make of weapon being used against assailants. I love firearms but I really just don't care anymore by page 100. Some of this is interesting but becomes rather long winded at times. Considering this is the first entry in the book, it wasn't a huge surprise to find the action lacking the first half. The climax at the end was really effective and provided a rousing finish to a rather slow, albeit short, read. I was enthralled enough with the quest to buy the remaining two books of the series.